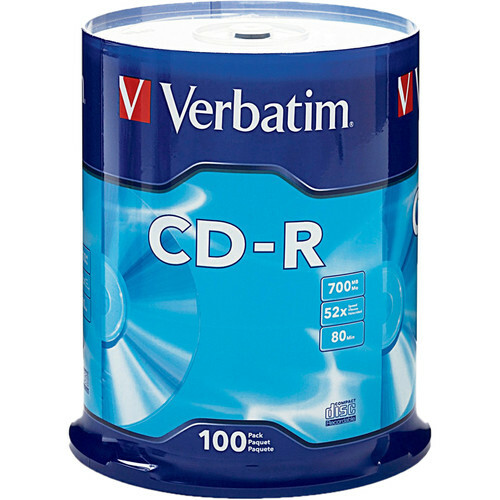 The Verbatim CD-R 80 Minute 700MB 52x Disc is a write once recordable compact disc approved for high speed 52x recording. The disc uses an ultimate performance recording dye for burning at high speeds. The disc has a 700MB data storage capacity or an 80 minute audio recording in less than 2 minutes. High grade write once recordable compact disc with a 700 MB data storage capacity or 80 minutes of audio recording. The disc is compatible with most CD recorders and players. CD-R 700MB Disc (Spindle Pack of 100) is rated 4.8 out of 5 by 73. Rated 5 out of 5 by Calusa from Good Discs, Great Price What can you say about recordable CDs? They're kinda like zippers; you assume that they're always going to work and barely notice them unless they don't. Well these Verbatim CDs have worked just fine. I've burned about a dozen of them and so far I've found them to be uniformly fast and reliable. Well what else can I say? I think that the most notable aspects of this product's purchase were the great B&H customer service, their reliable web site and essentially free (99cents) shipping that arrived in 4 days. Oh yeah, and the best price anywhere. Rated 1 out of 5 by Jim the Jumper from I dont know about there I have a Mac and for some reason I have a hard time burning this brand of blank cds. Well it would just spit my cds out and say there was a medium error. So I turned the burn speed down and then it worked but the cds wont play in my car. I've never had a problem with memorex, so i guess I'll just stick with them. It may just be my computer I have 2 macs both running 10.6.8 and i've read reviews of people having the same issue so just keep this in mind anyone who has these computers. Rated 5 out of 5 by Energy321 from Verbatim is all that I use I am sure there are other products that are good. After hearing it from a big copy house that Verbatim is the most compatible CD and DVD on the market.....it's the only product I use. Rated 5 out of 5 by dvaedrne from Good for Music I've used about 400 of these for burning audiophile quality music CDs and at 24x they burn flawlessly. Easy to label with a sharpie too. Rated 5 out of 5 by BD dancer from Good product, good price I use them for to record music cds. I've used only a couple so far, but they seem to be fine. The price is right. Rated 5 out of 5 by donald g. from Good Disc. I like the brand that I purchased I am well satisfied with Verbatim disc. Have used them for years. I use the product for backup and download music. I find them a very good quality disc. I have had no problem of opening them, ever after several years. What I can say is that I am well pleased with B & H. I have done business with them for a number of years now. I have yet to fine anything that I am not satisfied with. They are good people to do business with.. Rated 5 out of 5 by Kim from Does what it should I havent bought CDs for a long time and expected them to cost less. Oh well, they are a bit cheaper than when I archived pictures on CD years ago. Theyre just not as cheap as I expected. B&H have a great price on them compared to Office Depot and Staples so I was sold! These CD-Rs are being used to record vinyl records to CD so the music can be made digital. compare verbatim cdr #94554 or #94712 which is better? I just read that this was the one to buy. So far I think the 94554 is great! I sure either one is good to use!